Getting great entertainment while driving is not all that expensive. Music is always a matter of personal preference. While some like their music loud, others like it soft. Though nothing gets as personal as enjoying music on an iPod or cell phones, perhaps listening to songs while driving is not far behind. While it can be personal to a certain level while freeing you from the tangles of headphones wires, it can also be equally enjoyable to others in the car. A look at mid-level in-car entertainment options. The XAV-72BT comes with a 7-inch touch panel monitor and has a host of top-end features like Bluetooth, SensMe and ZAPPIN. The receiver can give 4.1 channel output with 52W per speaker, pretty powerful for a car audio system. The system has 18 FM and 12 AM preset stations and comes with tuning memory so that you don't have to search for your favourite stations every time. SenseMe lets you create playlists based on tempo and mood. 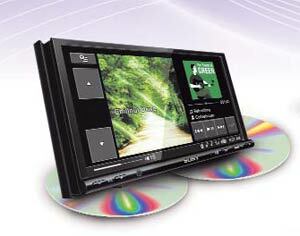 The built-in screen has a 17:9 Monitor Aspect Ratio and is good enough for DVD/VCD/CD playback. The unit can also control a USB source or iPod. This unit from Pioneer might have a smaller 5.8-inch widescreen touch display, but it still packs a punch. It scores over the others by being able to play from a SD/SDHC Memory Card Slot, along with having USB direct control for iPod/iPhone as well as Bluetooth. While some of its rivals can support wall papers, this one can become a full-fledged digital photo frame with colour customisation from the head unit. 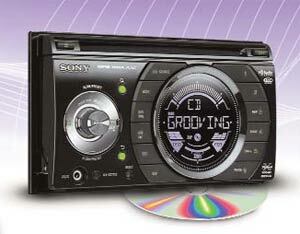 It can also play CD-R/RW, DVD-R/RW, which the other players will vroom away from. Powered by Supertuner IIID, the unit can store 24 stations with six presets. The built-in amplifier can power four 50W speakers and supports sub-woofer control. This DVD/CD/USB receiver comes with Bluetooth and motion sensor technology and has a 7-inch widescreen touch panel monitor. With 50W x 4 output, the unit comes with two-way control for iPod/iPhone as well as an external mode for the same. The sound is among the best in the class with Dolby Digital and 3-Band Parametric iEQ. 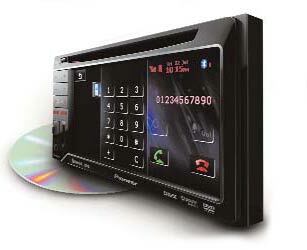 The head unit can display wallpapers too as it is compatible with JPEG along with MPEG 1, 2, WAV, MP3, WMA. There is a very handy remote to control the system, which incidentally comes ready for a steering wheel remote, in case you car has one. Among CD players, this is undoubtedly the best looker in town and strangely this could be the reason why it is among the most popular car audio options in India. But that doesn't mean the sound is not up to the mark, not at all. The unit comes with EQ3 Stage2 (3-Band Equaliser/7 Modes) and when coupled with four 52W speakers, you have a real mean machine. The unit plays MP3, WMA and AAC and comes decked with front USB, iPod control, ZAPPIN and quickbrowZer technologies.You can also shuffle music within genres, album, artist and playlists. 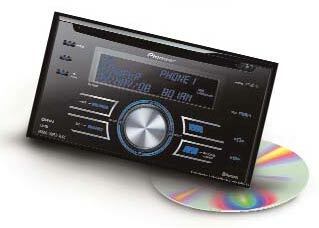 This unit from Pioneer is made for the iPod/iPhone fan. Along with USB control for the devices, this is among the few units that can play iTunes AAC files along with the regular MP3 and WMA. The Advanced Sound Retriever and 7-Band Graphic EQ make sure you don't get a distorted playback of your favourite music. There is best station memory and 24 radio stations can be stored with six presets. The three-band loudness control and bass boost gives the sound that little bit extra you might yearn for at times. The unit is Bluetooth ready, but you will have to spend on an adapter to get this feature going. 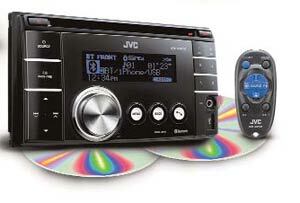 This Double-DIN USB/CD Receiver system comes with Bluetooth wireless technology and front AUX. With 50W x 4 output, the audio player supports 3-Band Parametric iEQ and two-way control for iPod/iPhone. But it has to be the Bluetooth functions that set this one apart. Along with Hands-free calls, it supports phone book access and transfer, audio streaming and even two phone switching over Bluetooth. A good bet if you like to talk and drive. There is also a three-pattern loudness control if you like to entertain people on the road as you drive along. The unit is compatible with MP3/WMA/WAV3.